Fresh off a genuinely epic fail at the Comedy Central roast of Donald Trump, America's national shame, The Situation, rejoined his sickbros of Jersey Shore for a street brawl with the heroes of Dragon Ball Z. Perhaps inspired by the endlessly bizarre hairstyles of DJ Pauly D. and Snooki, the CollegeHumor crew animated a surprisingly hilarious short that more than justifies its own ridiculous existence - something the cast of Jersey Shore has yet to do. 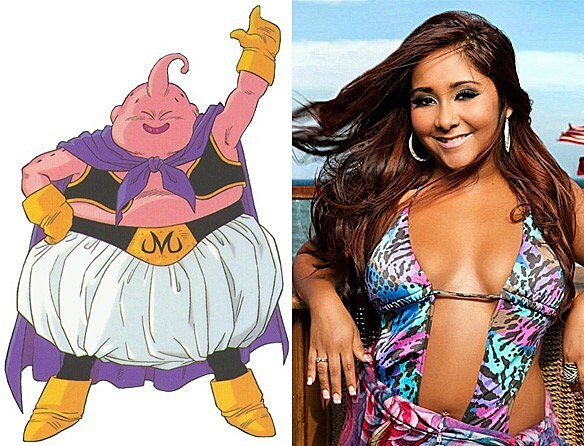 Because the men of Jersey Shore are chivalrous to a fault, they challenge the Z Warriors to a fight after Son Goku accidentally mistakes Snooki for the terrible Majin Buu. The "guido gorilla juiceheads" manage to hold their own against the Super Saiyans, perhaps due to mutations from too much fake tanning. Krillin's destructo-disc are repurposed as plasma-vinyls by DJ Pauly D., whose sick house beatz compell Vegeta to fist-pump in a truly ghastly manner. And of course, the repugnantly pickle-obsessed Snooki mistakes green-skinned Piccolo for a scrumptious "pickle monster". CollegeHumor's clip ends with a shout out to what is easily the most enduring Dragon Ball Z-inspired meme, which itself is the inspiration for the single greatest prank every played on anyone since Xenu deposited our souls here so many years ago.